We are leaving for a short mountaineering journey in the Argentière basin; leaving stopwatch or stress behind us, just with the wish to live a beautiful day shared with friends, away from the din and sanitizing routines of the workdays. By entering this peaceful kingdom a feeling of being out of the world, or, paradoxically, at the heart of it, fills us. Finally we’ll be able to re-energize ourselves! 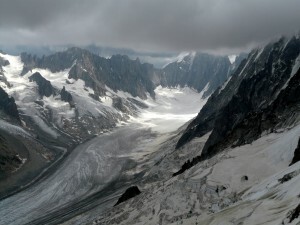 In support of this approach, Mountain Wilderness had planned a large gathering on Sunday, June 15th on the « Mer de Glace », in this high emblematic place of the Mont-Blanc, to call for an urgent regulation, harmonized across the 3 borders of the range, not allowing flights below 1000m above ground level, restricting this range to all motorized air traffic but the public service missions. As the weather did not permit to hold this event (see below), we carried these issues to the first meeting of the “Airspace” working group on June 23. Silence : We did it anyway ! Afraid of rain ? Not us ! On the right Sunday at the right place and at the right time, we did go with the family. We did it in spite of the MW event cancellation, to claim our desire for Silence in these high places. As shown by this photo, taken a little bit higher than the planned meeting point at the junction with the Leschaux Glacier…We were there at 11 am, after having gone down the ladders… and no need for crampons to hike that sea of stones. Picture taken, we left the place at about 2pm, at 3pm we were back at the foot of the ladders, meeting the first drops of rain. At 4pm our raincoats were asking for mercy, half an hour later our underwear were drowning. At 5pm we were naked in our cars, changing clothes. The event cancellation was the right decision, taking into account the short good weather window, especially considering that several people were coming from very far. Let’s have no regret then, but please, SILENCE !